Today, it's more important than ever for marketers to get the data and insights it takes to make better marketing decisions across their digital programs. Google Analytics Premium helps conversion-focused marketers get fast access to the insights they need to improve their digital campaigns-all for one flat-rate annual fee of $150,000. Google Analytics Premium Specialists can move enterprise customers smoothly from their existing installations to all the functionality and features of Premium, all for one predictable annual fee. 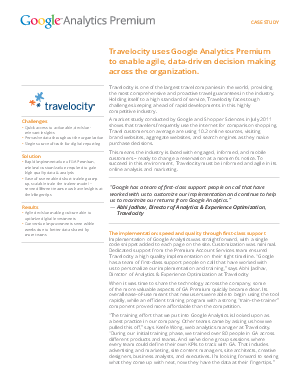 Read the case study to see how Google Analytics Premium helped Travelocity optimize its digital investments and conversions, and ultimately increase the power of Google Analytics for its business.